In early 1575 Robert Dudley invited to England the Italian Mannerist painter, Federico Zuccaro, who had made his name with allegorical decorations. Mostly working in Italy, in the mid-1570s he had travelled to France, to do work for the Cardinal of Lorraine, and to the Netherlands, where Leicester had him contracted. The idea was to paint a pair of portraits of the queen and himself. These paintings were intended to be displayed at the great festival at Kenilworth Castle in July 1575, an event that would span no fewer than 19 days and was to see the Earl of Leicester’s last, allegoric, bid for Elizabeth’s hand. Zuccaro arrived in England in March 1575 and got to work. In 1584 his contemporary, Raffaello Borghini, noted that Zuccaro had indeed painted life-sized, full-length portraits of both the queen and “Milord Lostre”. 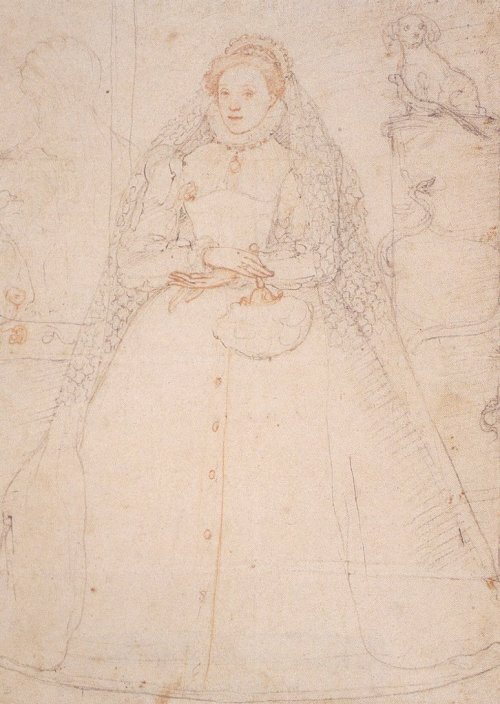 Today only two preparatory sketches in black and red chalk survive in the British Museum. Il Conte Roberto de leicestre | Milord lestre favorito de la | Reina d’Ingilterra nel 1575 | londra fedco Zucharo. The earl is partly dressed in a suit of armour identified as a set of “purple and gilt armour for field, tilt and tourney course”, made at the Royal Workshop at Greenwich early in Elizabeth’s reign. Robert Dudley would then have been in his late twenties, while he would have been almost 43 at the time of Zuccaro’s visit. A full-length oil painting of Leicester that was clearly based on the Zuccaro sketch survived until the Second World War. In it he wore another Greenwich armour in his possession, now in the Royal Armouries. The armour in the lost painting was painted over an earlier version resembling the suit of armour in the sketch – a change that would have been made according to Leicester’s wishes. 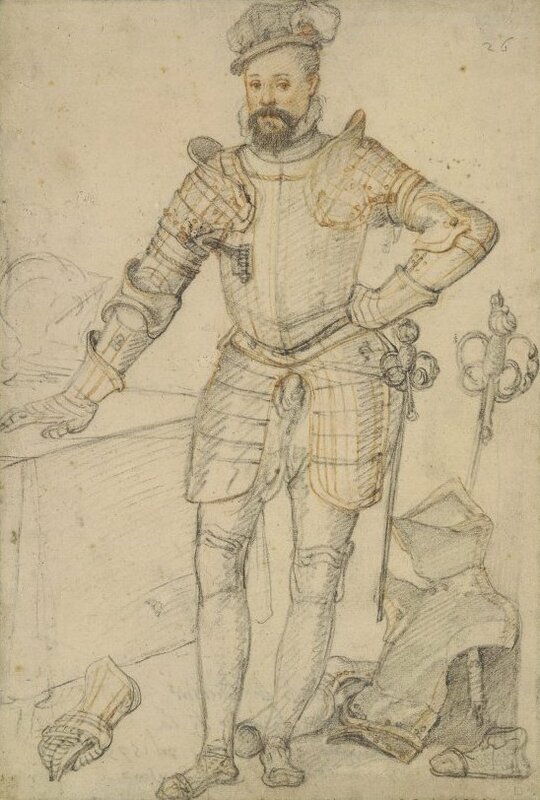 Other than the lost portrait, which may have been a copy, Zuccaro’s sketch is of exceptional quality and surely gives a perfect impression of Robert Dudley’s presence and his irresistible charm. The Progresses and Public Processions of Queen Elizabeth. Volume I. (ed. J. G. Nichols, 1823). Hearn, Karen (ed.) (1995): Dynasties: Painting in Tudor and Jacobean England 1530–1630. Rizzoli. This entry was posted in Elizabeth I, paintings, Robert Dudley and tagged Federico Zuccaro, Italian, jewels. Bookmark the permalink. Found your blog on Being Bess!! Loved your article!